Grand Trunk Pacific. 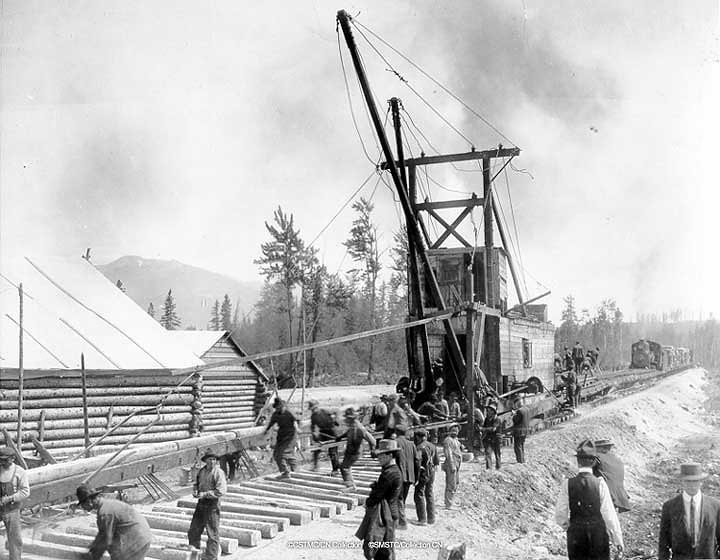 Fort Frazer BC, April 7, 1914. The month of April, we have been observing the 97th Anniversary of the Last Spike Ceremony at Fort Fraser British Columbia, completing Canada's second transcontinental railroad. This is the fourth and concluding installment. Two men were anxiously monitoring the tracklayer's progress across the 800 mile Northern District between Wolf Creek Alberta and Prince Rupert British Columbia. Bartholomew Kelliher, Chief Engineer for the Grand Trunk Pacific, and the government watch-dog, Collingwood Schreiber, from the Department of Railway Engineering in Ottawa. The original estimate made by Charles M. Hayes when he sought financial underwriting from the Government was $30,000 per mile. In the closing days, as two tracklayers steadily marched toward their final meet at Fort Fraser, costs were double the original estimate. I was fascinated by the "mantis-like" appearance of the tracklaying machines and after a considerable amount of research, this is what I learned. This is the F.A. Robert's Steam Tracklaying Machine. Manufactured in Seattle Washington. The Robert's system represents an evolutionary advancement of the Holman system. 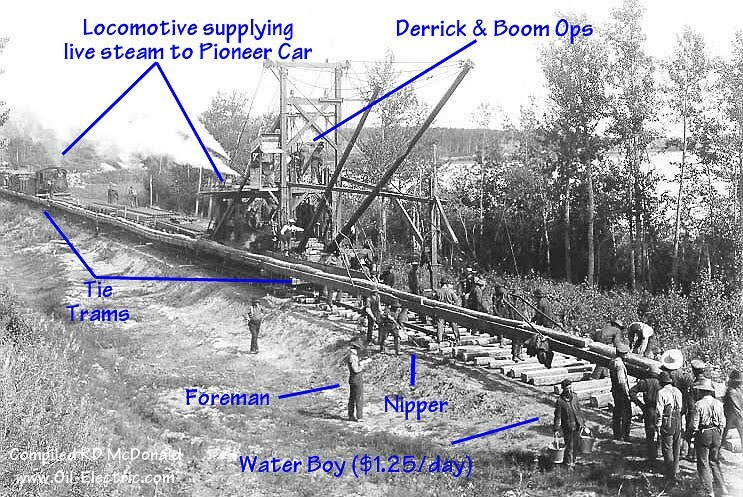 The Holman system require manpower to shove the rails and ties with pike poles along the conveyor system from the supply cars all the way forward over the delivery booms on the pioneer car. 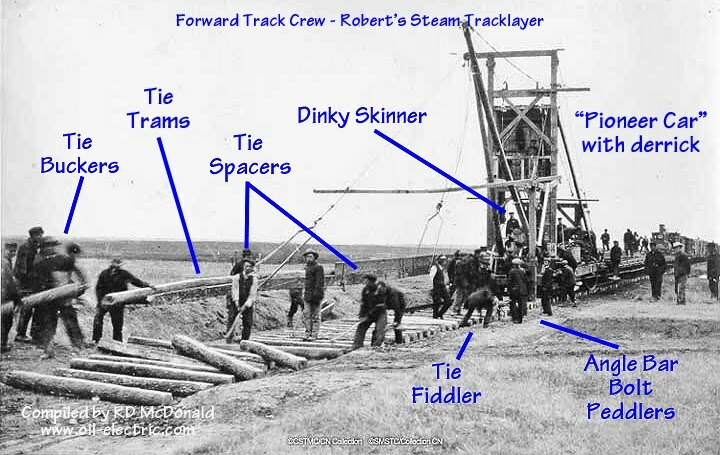 The Robert's Steam Tracklaying machine mounted a 20 horsepower steam engine on the the lead (pioneer) car, driving the conveyor belt to deliver the ties, and powering a derrick to pull the rails forward, to the delivery booms. The steam engine was supplied with live steam through pipes and flexible fittings, from the locomotive advancing the tracklayer. 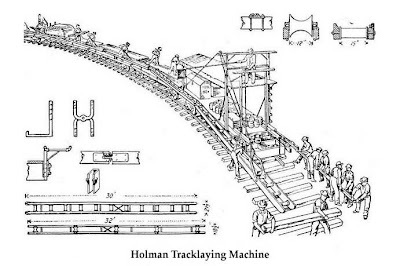 Kenneth L. Van Auken wrote the following description of the Robert's Steam Tracklaying Machine, for Railway Engineering and Maintenance of Way. 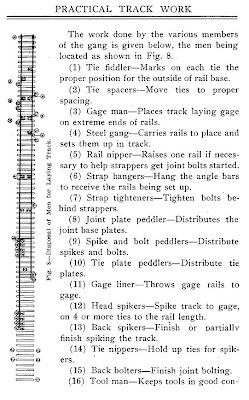 It was included in Practical Track Work, published in July 1915. The first car of rail behind the pioneer is "trimmed," that is on it is loaded angle bars enough to lay the amount of steel carried on the train. The angle bars are carried forward over the pioneer car and delivered as needed to the "strap hangers" in front. The rails beneath the angle bars are the last ones laid from the train; the angle bars will, therefore, be cleaned off by the time these rails are needed. The car next to the locomotive carries short lengths of rail, used to prevent joints from coming close to ends of bridges, etc. A system of trams, one on each side of the train, is used to carry the ties and rails to the front. The trams are made in sections, each 33 ft. long, the sides consisting of 2 - 4x10 in. planks. The tie trams are 14 in. wide, and rail trams are 12 in. wide, and they are held together by bolts on which are pipe separators. Near the bottom are live rollers, which complete trough shaped ways for ties and rails. A 20 H. P. upright engine, installed on the pioneer car, drives the live rollers in the trams by means of a tumbling shaft and gear or cog wheels. Steam for the stationary engine is piped from the locomotive. The shaft is fitted with "patent couplings," on one end of each section of which there is a casting containing a square socket into which the end of the next rod fits. Each length has a section of the shaft bolted to it, and as the trams are hung the rods are fitted together, thus forming a continuous shaft. The trams are "hung" on iron brackets or trusses which hook into the stake pockets on the cars. The trusses are made with flanged rollers on which the trams are placed, thus taking care of the slack of the train in starting and stopping. The trams have a coupling device which holds them together, the ones on the pioneer being permanently fastened. The tie trams, 660 ft. long, are operated on the right side of the train, while those for the rail, 240 ft. long, are on the left. The movement of the ties and rails is controlled by the "dinky skinner," i. e. the stationary engineer, so as to deliver them in front of the train as needed. A tie chute 53 ft. long provided with dead rollers is attached at the front end of the tram on the pioneer, and through this chute the ties are pushed by the ones coming forward over the live rollers. As fast as they are delivered at the end of the chute they are taken by the "tie buckers" and placed across the grade ready for the rails. A similar chute attached to the rail tram provides a way for delivering the rails in front of the pioneer. These chutes are supported at the outer ends by cables attached to the rear end of the pioneer car, and carried up over a high frame work or "gallows" at the front end. The rails are placed in the trams by three men, and are handled in front by four men. One man on each car places the ties in the trams. The spikes, bolts and base plates are peddled from the trailer as the train proceeds. The rails are held to gauge by bridle rods until the train passes over, all spiking being done in the rear. The train moves ahead one rail length at a time, when laying square joints, and half a rail length when laying broken joints. 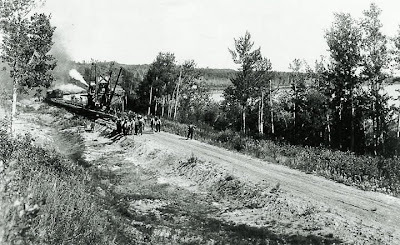 The trams are taken down when the cars are empty and replaced on the loaded cars when a new train arrives; 100 to 125 men are required for a full crew. Under ordinary conditions, a mile of track is laid in from three to four hours. The rail was laid on white oak ties, spaced 18 to 21 under a 33 ft. rail on tangent, and 19 to 22 per 33 ft,, on curves. The joints were ordinary four-bolt angle bars with spring nut locks. The heads of the bolts were staggered, i. e., bolts were put in with the heads alternately on the inside and outside of the rail. 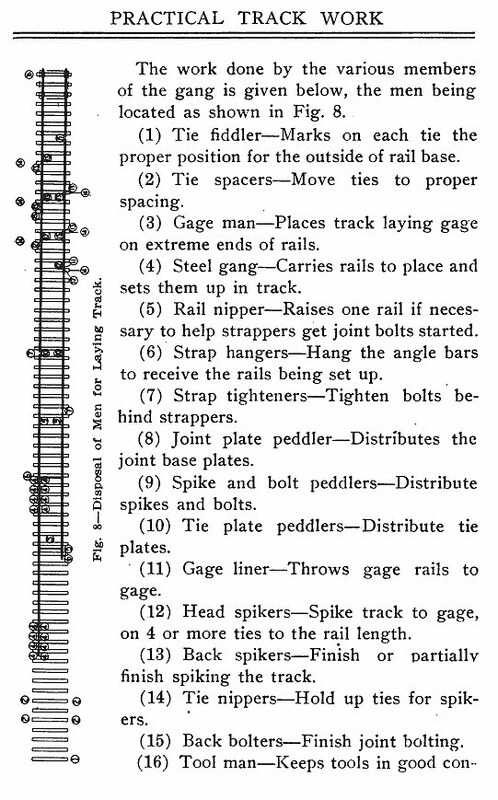 The number of ties per rail length was varied, 18 broad-faced ties being used, or 21 narrow-faced ties, on tangents. The work force back of the machine is organized as spikers and bolters. Track must be kept one-third to one-quarter spiked, close up to the machine, to provide for the return of the empty train." 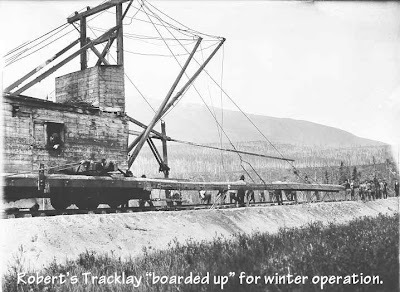 During Grand Trunk Pacific construction, using a 150 man crew - tracklayer plus follow up crew - the Tracklayer averaged 2 to 3 miles per 10 hour day. Along the Skeena River in the Mountain Section, crews averaged 2 miles per day. The angle bars referred to are those devices used to bolt two rails end to end. We have often heard of those angle bars referred to as "fish plates." 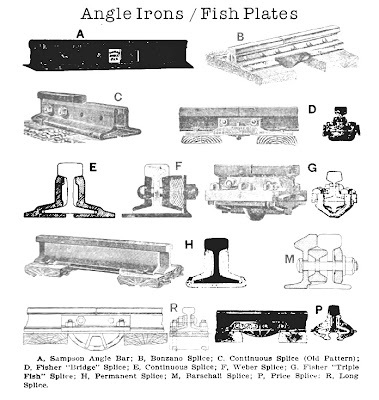 The railroad term "fish plate" can be traced back to an Englishman, Charles Wild, who was ostensibly granted "Letters of Patent" on a system for joining, or "fishing," two rails together. "Fishing" comes from old French. It describes creating a splint, using two beams, lashed securely around a broken or cracked mast on a sailing ship. His patent was vacated as not being "unique" and his case dismissed - "with costs" - in July 1865. Before tie plates, the foot of the rail was simply spiked to the tie. The obvious rationale for tie plates was to spread the loading of over a wider contact area with the tie, thereby reducing gouging into the tie, increasing the life span of the tie. Between Winnipeg, Manitoba and Prince Rupert British Columbia, approximately 7,300,000 ties were laid. On the Prairie Section, ties had to be imported. In the Mountain Section, ties were "found track-side!" 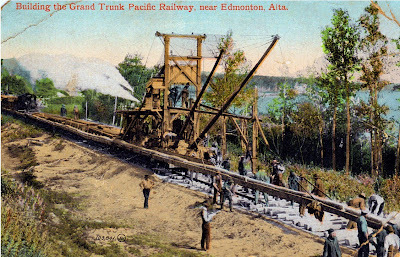 I'd like to thank Dave Gagnon for permitting me to feature the magnificent hand tinted color post card of the Robert's Steam Tracklaying machine. I urge you to visit Mr. Gagnon's "Rollie Martin Country," a cornucopia of Canadian Railroad history. In 1910, as the westbound tracklayer was passing Tête Jaune Cache ("cash" not "cash-A") British Columbia, a motion picture documentary crew from England, traveled thousands of miles to capture the Grand Trunk Pacific nearing completion. They shot the only known silent film of a Robert's Tracklayer in action. The Valemount (British Columbia) Historical Society, in conjunction with Valemount Community Television, produced a short film documenting their roots with the Grand Trunk Pacific. I accidentally stumbled over this video in the wee hours of the morning, about two weeks ago. Watch for the Robert's Steam Tracklayer. The scene in the color post card was taken at the same location as the documentary film crew, near Tête Jaune Cache. You can clearly see the tie conveyor in action, along with the derrick positioning a rail. Then a scene of the work force at the rear of the machine, as I described above. While the completion of the Grand Trunk Pacific was a source of great pride for Canadians, there was little to celebrate in Winnipeg. It took two years to complete the final audit of construction cost. One of the fatal flaws in estimating construction costs was the failure to include the time and expense incurred in shipping rail from Nova Scotia all the way around Cape Horn and up the West Coast to Prince Rupert. Within a few short years, the Grand Trunk Pacific morphed into the Canadian National Railways. wow, You have done a lot of research! I am writing an article for the North Thompson Times / Star-Journal in Clearwater and Barriere, BC , due Sunday, Aug. 30. 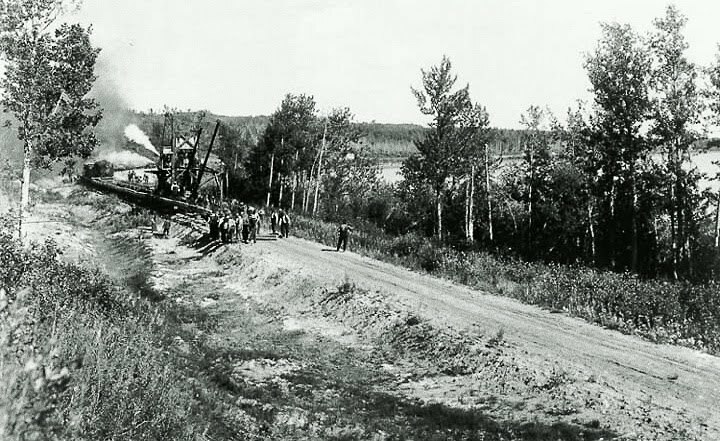 It is one of a six-part series noting the anniversary of the Canadian Northern Railway completed in 1915. May I refer readers to your site? I do not have space to include the amazing photos you have collected, but I am sure readers would love to see them, so I can direct people to open your page. You can google my name or "Valley Voices" in North Thonmpson Times to read my pieces. Please and thank-you for permission to refer readers to your site.